I went to the feed store today to get some items and they had chickens. Growing up we always had chickens and never had issues raising them. I was unaware of this particular breed until I bought them and then the lady behind the counter said something I had never heard before "never leave them with feed more then 12 hours a day or they will explode" Ummmm....ok that I must admit was a little scary to me. So when I arrived home I got to googling and I must admit found nothing reassuring about the future of my cute little fuzzy babies I had just purchased. 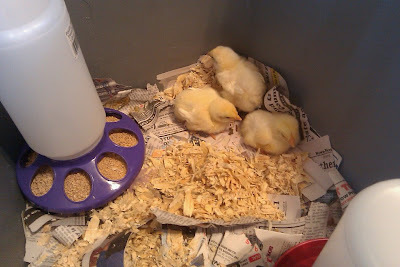 So now my goal is even getting them to a healthy age where they may lay eggs. If I can get them to that I have found there seems to be hope of keeping them alive. So here I am to share my journey with you day by day as long as mother nature will let me. I'm so unsure about what to do we never used any kind of heat for our chicks growing u but I don't want to kill them either so they are staying in the house to avoid the chill right now. I have water in there at all times but I am only putting the feeder in for 15 minutes every 3 hours during the day right now. At night only water. Hopefully this limit will help them grow slowly and not live their lives with their face in the feed bowl. So heres to hoping :OP in the mean time here is a cute picture for today. One of them must be younger then the others it has less little feathers.